(Nanowerk News) When it comes to communicating with each other, some cells may be more "old school" than was previously thought. The findings, which are scheduled for online publication July 1 in Nature ("Nanotubes mediate niche–stem-cell signalling in the Drosophila testis"), offer new insights on how stem cells retain their identities when they divide to split off a new, specialized cell. 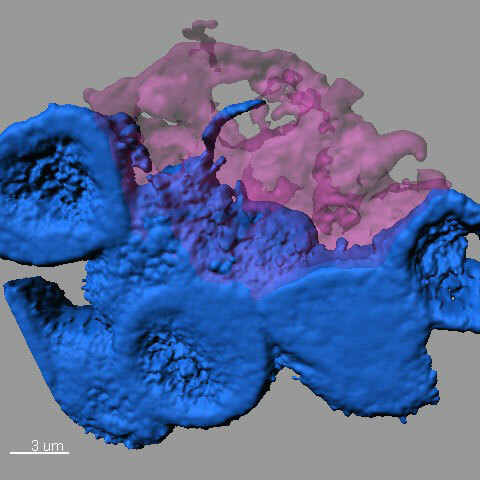 Confocal microscope image showing stem cells (blue) clustering around a hub in the stem cell niche (pink). One stem cell extends a nanotube into the hub. "There are trillions of cells in the human body, but nowhere near that number of signaling pathways," she said. "There's a lot we don't know about how the right cells get just the right messages to the right recipients at the right time." The investigation began when a postdoctoral researcher in Yamashita's lab, Mayu Inaba, approached her mentor with questions about tiny threads of connection she noticed in an image of fruit fly reproductive stem cells, which are also known as germ line cells. The projections linked individual stem cells back to a central hub in the stem cell "niche." Niches create a supportive environment for stem cells and help direct their activity. "I had seen them, but I wasn't seeing them," Yamashita said. "They were like a little piece of dust on an otherwise normal picture. After we presented our findings at meetings, other scientists who work with the same cells would say, 'We see them now, too." It's not surprising that the minute structures went overlooked for so long. Each one is about 3 micrometers long; by comparison, a piece of paper is 100 micrometers thick. Fruit flies are an important model for this type of investigation, she added. If one was to start instead with human cells, one might find something, but the system's greater complexity would make it far more difficult to tease apart the underlying mechanisms.